The Baltimore Orioles are something of a throwback to the old days, in more ways than one. Not only are the Orioles dominating the American League East by margins reminiscent of their days under the late Hall of Fame manager Earl Weaver, but they are doing it the same way. 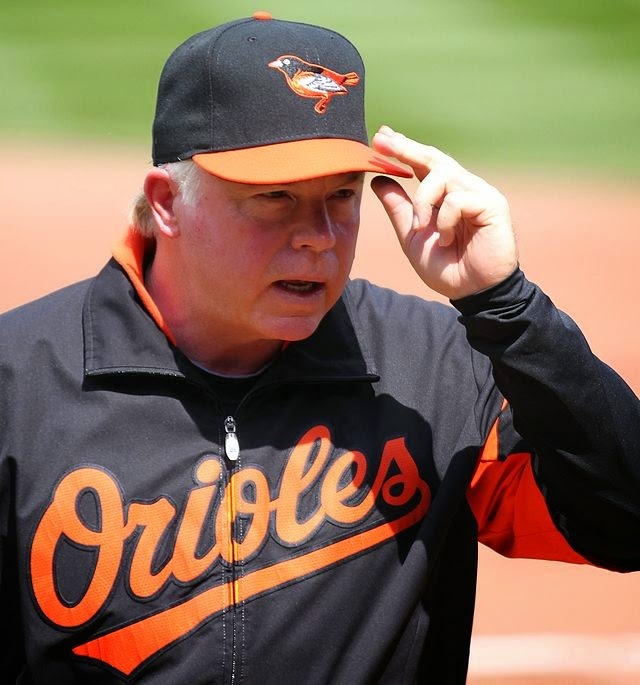 Baltimore Orioles manager Buck Showalter even looks a little like Hall of Fame manager Earl Weaver, and he's definitely playing the same way while getting similar results in 2014 (Keith Allison/Creative Commons Attribution-Share Alike 2.0 Generic license). The American League East division normally is one of the most discussed in the Major Leagues, for obvious reasons involving geography and its large media markets. This season is a little different. The division's leading club hails from one of the game's smallest markets, and its rise is rather sudden. Indeed, the standings on the morning of Aug. 22 revealed that the Baltimore Orioles not only led the division, but they held, by far, the largest advantage of any division leader, a full nine games ahead of the New York Yankees. The quickness of Baltimore's rise is one of the game's remarkable untold tales in 2014. Through games of June 16, the Orioles sat as the third-place club among this unremarkable collection, five games down to the Toronto Blue Jays. From that date through Aug. 21, the Orioles notched a 38-18 performance, gaining a remarkable 14 games on first place in just more than two months. Three factors stand out, and we shouldn't be surprised that they are the factors on which the late and great Orioles manager Earl Weaver staked his great Baltimore clubs for about 20 years – pitching, defense and three-run homers. First, pitching. The Orioles ran into a lot of trouble getting batters out for the first two months of the season. Through May 28, they carried a staff ERA of 4.33. The ERA across the American League right now is 3.86. Starting on May 29, the Orioles have a 3.11 ERA. The odd part is that almost none of this improvement has come from the starting rotation. Take a look at that Baltimore starting rotation and no one looks great by the season numbers. Take a look at their starters since June 15, and they look almost exactly the same, except for one. In his 12 starts since June 15, Chris Tillman is 5-1 with a 2.23 ERA (80 1/3 innings) with a .197 batting average against him. But the rest are what they have been all season, which is solid, though just better than league average, if that: Wei-Yin Chen (103 ERA-plus), Bud Norris (105), Miguel Gonzalez (102), Kevin Gausman (102) and Ubaldo Jimenez (80). Despite that basic consistency, though, the Orioles are getting better starts across the board. Through May 28, they took only 17 quality starts in 51 games (33 percent). From then until Aug. 22, they made 43 quality starts in 74 games (58.9 percent). But the real difference is in the bullpen. According to the Orioles game notes entering games of Aug. 22, we find numerous excellent recent performances. Brandon Beach allowed one earned run in his last 13 1/3 innings. Zach Britton led the AL with 27 saves, converting 12 straight opportunities. Brian Matusz allowed two earned runs in his last 12 innings. Andrew Miller allowed one earned run in his first 7 1/3 innings since coming over in a trade with the Boston Red Sox. Darren O'Day allowed one earnie in his last 27 innings (24 games) with 33 strikeouts. In total, the Baltimore bullpen leads the AL in holds (73) and is second in saves (56, behind only the Yankees with 57). Defensively, the Orioles are tied with the Angels for third in AL defensive efficiency (.704). The Orioles have made the second fewest errors (59, behind only the Seattle Mariners, who have 58) among AL clubs and they are fourth in double plays with 126. They are tied with the Mariners for the top fielding percentage (.988), and they also lead the AL in total zone fielding runs above average (45) and defensive runs saved above average (45). They've got several players who are plus defenders by one game or more according to WAR, including shortstop J.J. Hardy (1.5), catcher Caleb Joseph (1.5) outfielder David Lough (1.0), third baseman Manny Machado (1.1), outfielder-first baseman Steve Pearce (1.5), and second baseman Jonathan Schoop (1.3). Then, there's the three-run homer. The Orioles led the AL in homers with 161 entering games of Aug. 22. According to the Orioles games notes, 16 of them were three-run homers, accounting for 48 of their 540 runs, or 8.8 percent of their runs. According to Deconstructing Major League Baseball, 1991-2004 by William Darby, 7.1 percent of the runs scored across the big leagues came on three-run homers from from 1991-2000, which includes the start of the "steroid era." Indeed, a full 47.4 percent (256 out of 540) of the Orioles runs scored on homers through Aug. 21. In no decade of the 20th century did the percentage of runs scored on homers in Major League Baseball top 34.1 percent (1991-2000), according to Darby. Thus, the Orioles are quite unusual in their reliance on the home run for generating offense. To absolutely no surprise, given the Orioles' reliance on the home run, manager Buck Showalter runs his club less than any other club in the game. The Orioles entered Aug. 23 last in Major League stolen bases (32), caught stealings (14) and, of course, attempts (46). The average Major League club had stolen 72 bases and been caught 27 times. The Orioles also are last in the AL at running from first base to at least third base on a single, making the trek 53 times out of 248 such situations (21.4 percent). By comparison, the Angels, who run more than anyone, made that trip 93 times in 253 such situations (36.8 percent). Of course, anyone can score from first on a home run, and the Orioles have them up and down the lineup. Most remarkable among their sluggers, of course, is Nelson Cruz, the free agent no one wanted last winter. Cruz did time last year for performance enhancing drug use, but the main deterrent to signing him was that it would have cost the signing club a draft pick. The Orioles decided to take a flyer on Cruz after they already had blown the pick to sign Jimenez. Cruz signed a one-year deal for $8 million, and he has been worth putting up with the lost pick and poor pitching by Jimenez, leading the Major Leagues with 34 homers. The Orioles have some other swatters, too, including Adam Jones (24 homers) and Chris Davis (21), giving them three players in the AL's top 15. And a lot of other hitters kick in, like Pearce (13), Swoop (12), Machado (12) and Nick Markakis (11). The Orioles have lost the first two games of their series this weekend against the Chicago Cubs at Wrigley Field, and they also now have lost Machado for the season after knee surgery. Losing Machado is tough, but they've filled in by moving Davis to third base and putting Pearce at first. As far as losing the first two of a weekend series in Chicago, it does look bad, but it's par for the Orioles. After games of Aug. 23, the Orioles are 10-12 on Fridays, 10-12 on Saturdays and 9-11 on Sundays. But they are 12-3 on Mondays, 10-5 on Tuesdays, 12-7 on Wednesdays and 10-4 on Thursdays, per the club's game notes. So, the Orioles' bulging lead in the AL East fell to seven games entering Sunday's contests. Chances are, they'll starting building that lead again on Monday. Editor's note: All advanced statistics in this piece are from Baseball-Reference.com, unless otherwise indicated.